Shay Facey has total belief the Cobblers are going to secure their Sky Bet League One survival. Signed from Manchester City in the January transfer window, Facey has made an excellent start to his Town career on a personal level, but the team is still in deep trouble. They dropped back into the relegation zone following last Saturday’s 3-0 Sixfields defeat to Roherham United, and although Tuesday’s 1-1 draw with Shrewsbury has raised spirits, they travel to Fleetwood on Saturday still in the bottom four. A win at the Highbury Stadium this weekend will see them clamber out of the relegation zone, and Facey is desperate to do just that and start the climb away from trouble as quickly as possible. 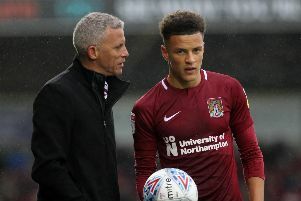 The Cobblers have just eight games left to save themselves, starting this weekend, and Facey said: “It’s a big game, and every game from now on is a cup final for us. “We have to go on and put our stamp on the matches going forward and try to win as many as possible and pick up as many points as possible. “I’ve never played at Fleetwood before so it’ll be a first for me and hopefully I’ll start again and can have a good effect on that game and come away with three points and a good performance. “We’ve got loads of talent in the dressing room. “Guys are coming off the bench and making an impact and no matter who’s playing, I believe we’ve got more than enough to definitely stay up and win a few more games before the end of the season. “We’ll see how the gaffer sets up on Saturday and then take it from there. “I have every faith that we’ll go on and win games, especially if we put in performances like we did on Tuesday because I thought we were fantastic. Facey was recalled to the team on Tuesday for his first start since he injured his hamstring in the defeat to Rochdale last month, and he played as right wing-back in the stalemate with the Shrews. It was a much-improved performance by Town, and Facey says the showing proves exactly what staying up means to the players. “It was a good draw against a tough side,” said the 23-year-old. “We needed a reaction after the performance on Saturday and I think we showed that. “Hopefully we can take it into this weekend’s game and we can get the three points. “It’s one of those situations where we’ve looked ourselves in the mirror and just asked if we’re really giving our all, if we’re really fighting for our place in the team and do we want to stay up and how much does it mean to us. Facey, who scored his first goal for the club against the Shrews, has yet to be behind at any time in a match in a Cobblers shirt, as he was injured with the score at 0-0 in the loss to Rochdale, and he has certainly made an instant impression since signing at Sixfields. He initially played right-back in a back four, and on Tuesday was wing-back in a 3-5-2 formation, and he says he is happy to play wherever he is asked. “I’ve said it before, anywhere I’m asked to play I’ll try my best,” he said. “I enjoyed it on Tuesday. “It was a bit of a shift but all the lads put a shift in and the goal’s a bonus.